The Manhattan outpost of Motorino just opened a few months ago in the old Una Pizza Napoletana space. Saturday night after some fireside drinks at Shoolbreds we decided to walk over. We showed up around 7:00 and there was a 15 minute wait. The hostess suggested we get a drink next door and she came and got us when our table was ready. That was really nice. I always feel bad hovering over people while you wait for a table in small little restaurants. Three of us were dining tonight so we decided to split two appetizers and two pizzas. No we are not pigs- the pizzas are actually pretty small. I was really excited to see the Montly Cru red on the wine list from Brooklyn Oenology. I bought a couple bottles last time they were at the New Amsterdam Market and they were fantastic. Brooklyn Oenology specializes in New York State wines with original artwork from Brooklyn on their labels. The neatest thing is that their labels peel off so you can keep the art once the bottle is finished! The waiter had no clue what I was talking about until I peeled off the label to show him. See you can learn something new every day! For out first appetizer we ordered the Fire Roasted Mortadella. Fire Roasted Indeed! This came out with the most beautiful charred and bubbly top I’ve ever seen. Mortadella always looks so disgusting to me at the butcher but here I was ready to dive right in. 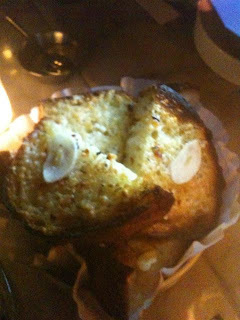 They brought out some tasty bread on the side with huge hunks of garlic to accompany the meat. Unfortunately the fire roasting only changed the aesthetic of the meat, the taste stayed the same. My companions absolutely loved it but I just have never really enjoyed the strange flavor of mortadella. 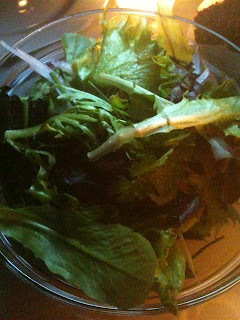 I pretty much stuck to eating our other appetizer the Mixed Green Salad. This was a pretty basic salad filled with parsley, chives, red onion, olive oil and vinegar. It was a good salad but a little bit boring. Next time I would probably try something more adventurous like the beet salad. I don’t usually like beets but the addition of ricotta to the mix sounded very interesting. 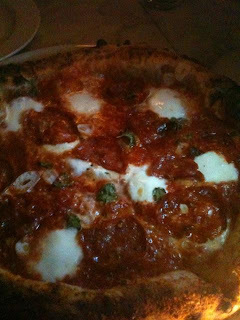 Our first pizza was the Soppressata Piccante. This was basically a regular margarita pie with the addition of soppressata, fresh chilies and garlic. Wow this pizza had a lot of different flavor profiles going on all at once. My first bite I really tasted the pizza itself- good slightly sweet sauce, soft mozzarella cheese and an amazing crush of fresh garlic. My second bite I really got more of the soppressata and chili flavor. The chilies gave the pizza a nice little kick and it was interesting to taste soppressata instead of pepperoni. This was a very great pie but the second one was even better. The picture didn’t really come out but this is the Special Brussels Sprout. Oh my goodness this pizza was outstanding! They peeled the Brussels sprouts apart so they fell into different layers across the entire pizza with strips of pancetta and garlic mixed throughout. The nutty flavor of the sprouts and the sharp bite of the parmigano reggiano were a match made in heaven. Each bite was so utterly delicious I began to think that two pies were not going to be enough. The best part about both of these pizzas however has got to be the crust. Oh that wonderful crust! 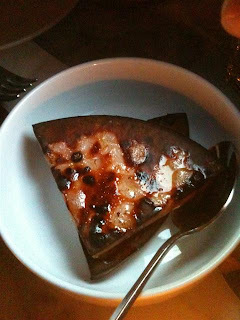 It was so light, airy and delicious I don’t even know how to explain it. It was so delicate I felt like it could possibly melt on my tongue if I had been able to savor it for a minute. I usually leave my crusts behind- here I could have eaten a whole pizza of just crust! The other thing that really made both of these pies stand out for me was the fresh ingredients. Before even tasting the pizza you could smell the wonderful aroma of each individual part. The rich tomatoes, the earthy sprouts, the enticing garlic, etc. These pies were made with a lot of good produce and a lot of love. For $14 a piece these pizzas are not cheap. I could probably eat one whole pie by myself and I’m sure Mr. T could easily as well. However I think the price is worth it. I was happy at the end of our meal and didn’t think twice about the size of our check. 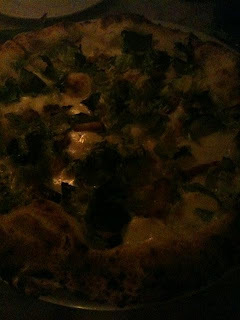 We had excellent service, a wonderful bottle of wine and truly fantastic pizza. Motorino really hit the mark.